The magical little animal fairy. Gorgeous little girl dressed as a fairy. Suffolk and Essex fairy photos. I was primarily photographing today on my flower fairy swing in my garden, but this gorgeous little girl dressed as a fairy was loving the shoot so much, we decided to take some pictures on the grass and she asked if she could be an animal fairy. So with some creative editing, I produced this gorgeous image. 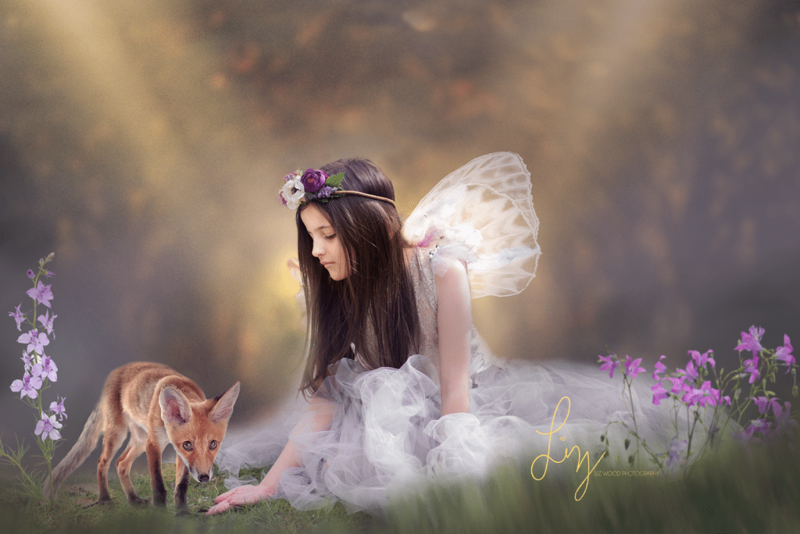 Fine art fairy sessions are available in my studio Liz Wood location or on location around Suffolk, Essex, Cambridge and London. These sessions are just magical for all those little ones who love the wonder, enchantment and magic of fairies. I own a collection of dresses in varying sizes, wings, halos and props to enhance the experience, the new set is almost complete following on from the snow fairies at Christmas, with a range of beautiful ferns, flowers, a “pond”, the fine art series flower fairies will be available throughout the year, and really are magical sessions that children absolutely love. To see more of my magical fairy photos click the link HERE! Liz Wood is based on the Suffolk/Essex border, within easy reach of Colchester, Halstead, Braintree, Ipswich, Bury St Edmunds, Chelmsford, Cambridge and London. All photoshoots are risk assessed and beautiful fine art images are produced to choose from.